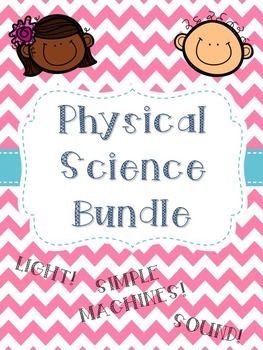 This bundle contains the task cards, morning work (which could be used as homework and/or class work), and study guides (which could be used as a pre/post assessment) I created for my light, sound, and simple machine units. The items included can also be purchased separately in my store. Please let me know if there is anything I can do for you or your students! 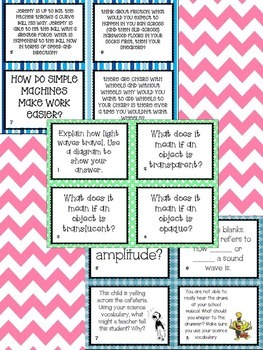 These are task cards I created to use to check for mastery with our Light unit. These are designed with 4th grade in mind, but they could be used in other grades are remediation, pre-teaching, or extension. Each is open ended to ensure they are not just guessing the answer and not really taking the time to think about and apply what they know. I included an answer sheet students could use to record their thoughts. It is large enough to allow for the short answer. I have my students use notebook paper to save on copies, but the option is there! You can copy the answer sheets front to back. These could be used as individual practice, an assessment, a group activity, homework, or for an early finisher. 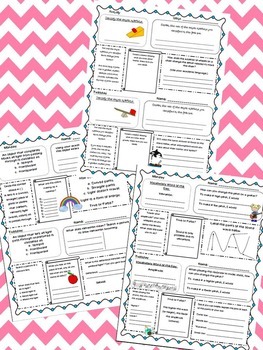 I hope your class gets great use out of these task cards! These are task cards I created to use to check for mastery with our sound unit. These are designed with 4th grade in mind, but they could be used in other grades are remediation, pre-teaching, or extension. Each is open ended to ensure they are not just guessing the answer and not really taking the time to think about and apply what they know. I included an answer sheet students could use to record their thoughts. It is large enough to allow for the short answer. I have my students use notebook paper to save on copies, but the option is there! You can copy the answer sheets front to back. These are task cards I created to use to check for mastery with our simple machines unit. 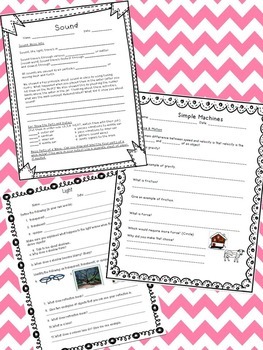 These are designed with 4th grade in mind, but they could be used in other grades are remediation, pre-teaching, or extension. Each is open ended to ensure they are not just guessing the answer and not really taking the time to think about and apply what they know. I included an answer sheet students could use to record their thoughts. It is large enough to allow for the short answer. I have my students use notebook paper to save on copies, but the option is there! You can copy the answer sheets front to back. ~~How does the hitting a ball change speed and direction? ~~How can you reduce friction? ~~How do we reduce friction? ~~How do they make work easier? This is the study guide I created to go along with our science test that comes with our science text book. This could also be used as an assessment over light at the end of your unit. With mastery in mind, this was created using short answer questions. This ensures that students truly know the material and are not just guessing. I hope you and your class find this useful! This was designed with 4th grade standards in mind, but this could be used as enrichment in lower grades or as remediation in upper grades. Please let me know how else I can help you and your class! This is the study guide I created to go along with our science test that comes with our science text book. This could also be used as an assessment over simple machines at the end of your unit. With mastery in mind, this was created using short answer questions. This ensures that students truly know the material and are not just guessing. I hope you and your class find this useful! This is the study guide I created to go along with our science test that comes with our science text book. This could also be used as an assessment over sound at the end of your unit. With mastery in mind, this was created using short answer questions. This ensures that students truly know the material and are not just guessing. I hope you and your class find this useful! ~Students are given scenarios and asked what was being changed (pitch or amplitude) and how they could change it and/or to explain what was happening. Critical thinking! This is the morning work I created for my class to complete throughout our light unit. In the beginning, they will utilize their resources to research the answers. As we progress through the unit, students could complete this on their own as a review. This could be used as a preteaching, homework, morning work, daily review, centers...the possibilities are endless! I hope your class enjoys these as much as mine does! Please let me know if I can do anything for you or your students. This is the morning work I created for my class to complete throughout our sound unit. In the beginning, they will utilize their resources to research the answers. As we progress through the unit, students could complete this on their own as a review. This could be used as a preteaching, homework, morning work, daily review, centers...the possibilities are endless! This is the morning work I created for my class to complete throughout our simple machine unit. In the beginning, they will utilize their resources to research the answers. As we progress through the unit, students could complete this on their own as a review. This could be used as a preteaching, homework, morning work, daily review, centers...the possibilities are endless! Students will demonstrate the relationship between the application of a force and the resulting change in position and motion on an object. the initial one is applied.